This gorgeous Regency Rose Plume Agate gemstone is so dramatic.The stone has feathery tan and white going through it which enhances the turquoise color. 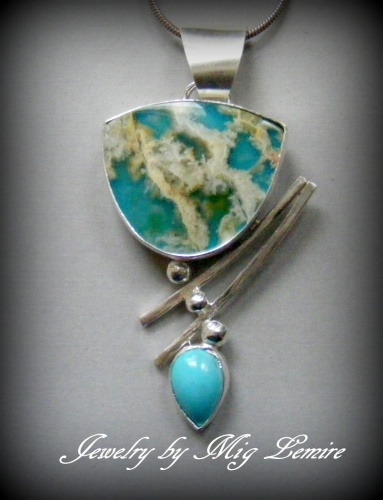 Accented with Robins Egg turquoise on stone on the bottom, this pendant is truly one of a kind. Sterling silver balls add to the pop. Piece measures 2" long and 1" wide and comes with a sterling silver chain.